Let us not forget that my main passion is for the horses. The steeds of my life were only surpassed in my heart by the occasional wolfhound, truth be told. Unfortunately, I had to give up riding in middle age, due to arthritis. My brittle bones and sore joints. My many aches that even the prolonged rest cures could not fix. Before that time, however, I delighted in the speculation that I would one day be thrown. That during a hunt, my mount might stumble and send me bustle-over-sidesaddle, hurling to the earth. My Lady, Marie Festetics, used to pray, “God grant that my beloved Empress return home safe and sound.” Which I always did. And Austria mourns of its Empress bereft. To ride with our hounds, from old Shuckburgh Hill. It is with bitter dismay, I must admit, that I never had the chance to perform at the Olympic games. 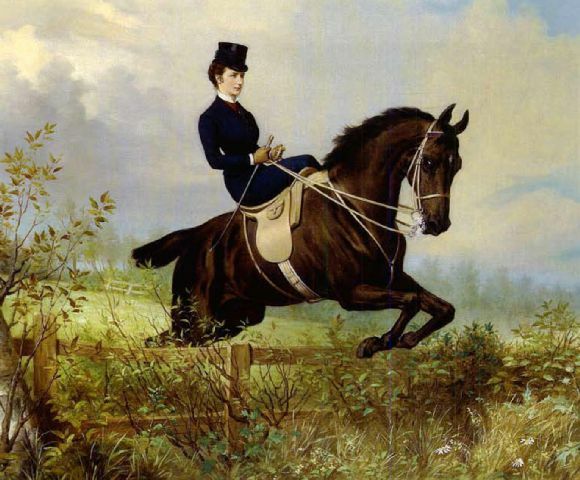 Sidesaddle jumping–I would have been a shoe-in for the gold! we darenst be seen straddling the mount! Thank goodness for dear Mr. Pellier and his invention of the leaping horn. If not for him, I could never have controlled my darling piebald, Cupid. In the days when Mummi rode (before marriage, and then, only a handful of times) she rode atop a saddle fashioned like a chair, with a planchette footrest on the side. It was as though she were in her living room, and if the horse had any spirit whatsoever, down Mummi went, skirt over head, to the hard earth below. If I had my druthers, however, I might wear only pantalettes and ride astride, like Papa and Gackl. One can certainly get a higher jump from one’s steed with its barrel between the legs. if my crinolines get any fuller, I will be far too fancy to ride! While we’re on the subject, I find it disconcerting that certain types of exercise have been banned in places. That horrible man, Mr. Walker and his wretched little book, “Exercise for Ladies,” caused quite a stir. Oh but didn’t the Baroness smile as she presented the atrocious tome on my 11th birthday, hissing, “Your Grace, you’ll see in these pages that if you continue your pleasure rides, you will become so deformed, that your womb will never house a proper Monarch.” So self-pleased was she, that she actually feigned the act of washing in air, her hands like two serpents squirming inbetwixt themselves!